Late last week the Federal government announced a national action plan to halve the number of young people living in residential aged care by 2025. This was an important announcement for the more than 6000 young people currently living in residential aged care and the 50 young people who join their ranks every week. Why do we even need an action plan? With the National Disability Scheme (NDIS) rolling out across the country since 2016, it’s a fair question to ask why a national plan is even necessary. The data below explains why the plan is so important. The stats tell us that people with complex disabilities are having difficulty accessing the NDIS, and getting the support and housing they need to avoid or leave aged care. At 30 June 2018, there were around 6,043 people under the age of 65 years living in residential aged care. Two years before that there were 6,242 – so the NDIS has reduced the numbers by just three per cent. For those people the NDIS really has changed their lives – but progress has been incredibly slow and too many young people are still stuck in aged care. How many young people in residential aged care are now in the NDIS – and is it helping them? As of December last year, two thirds (66%) of all young people in residential aged care have been assessed as eligible for the NDIS. About half of this group, 2,988 (49%) have an active plan – this means their plan has been approved and supports have started. 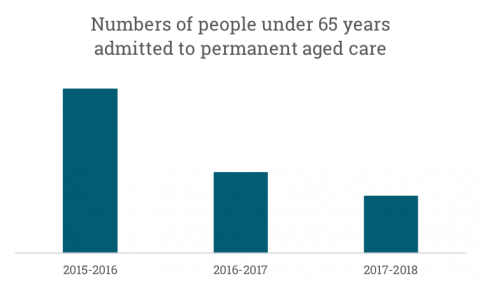 In the financial year 2017-2018, 1,853 younger people left aged care. Sounds hopeful – until you learn that sadly most people left due to their death. More than 57% died while in care. The next largest group – 391 (21%) – were transferred to other residential care. Only 198 (11%) of the leavers returned to family or a home of their own. All of which helps to explain why the action plan is so necessary and so important. The NDIS has not been able to push through the many barriers to getting young people with complex disabilities into housing that better meets their needs – and in fact too many are slipping through the gaps between the NDIS and the health system. Targeted action is clearly needed to make sure the NDIS works for young people with complex support needs. So what is in the action plan? The plan says that all young people in aged care will have access to the “NDIS complex needs pathway” by July 2019. NDIS participants in aged care should receive face-to-face planning and have access to a support coordinator. This should improve the planning process. For people with disability stuck in hospital and at risk of aged care, you can now expect that the NDIS will make eligibility decisions more quickly, and provide a more skilled NDIS planner who understands the health system. The NDIS will also speed up home modifications for people in hospital, and will fund bridging housing where home modifications are taking too long. The plan also commits the government to looking at whether a specialist “plan implementation service” is needed for NDIS participants in aged care and in hospital. That might look like a special Local Area Coordinator who can help people with disability navigate the NDIS and housing and health systems. The action plan announced last week has loads of potential. It recognises the need for all sectors – health, housing and disability – to work together to reduce the number of young people admitted into care. It also recognises that there should be better options available than residential aged care for young people and shows the government is committed to finding and funding alternatives. At the same time, we would all agree that no young person with disability should be living in aged care just because there is nowhere else for them to go. We would also agree that no young person currently in aged care should be kept waiting. But to get to that point, we need systems to change. We all need to get to work so that any young person who wants to avoid aged care has a place to live in their community – and not be forced into care because systems have failed them. And if you are a young person living in aged care now, or think that is where you might end up, it is good to remember that the NDIS Act gives you the right to live in the community, and to live where and with whom you choose. With this action plan, you should know that if you want to leave, you will get the support and services you need to live a good life in the community. Postscript – If you are currently an NDIS participant stuck in hospital or aged care (or are supporting someone who is), you can search for alternative disability housing on The Housing Hub website, or find some resources to help you navigate the NDIS and implement your plan on the Summer Foundation website. Dr George Taleporos is the Summer Foundation’s Policy Manager. He is responsible for coordinating the organisation’s government engagement, developing policy and communicating with key stakeholders. 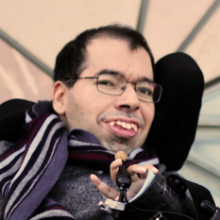 George has over 20 years experience in the disability field, focussed predominantly on advocacy, human rights policy and practice, service development and management. He has a PhD in the field of psychology, a Graduate Diploma in educational psychology and Honors in sociology.